I’m sorry for the long silence – I’ve been in the UK, giving a new presentation on the Uruzgan air strike of February 2010, and learning much en route in Lancaster, Lincoln and Bristol. I’ll try to post extracts from the (developing) presentation in the next several weeks as I think about turning it into an essay, but I’ll still be on the road – or, more accurately, on vacation, so things will be irregular for some time to come. I expect regular postings to resume in early July, when I’ll be back in Vancouver. I’ve also spent several days in Flanders, visiting some of the major sites associated with the First World War. 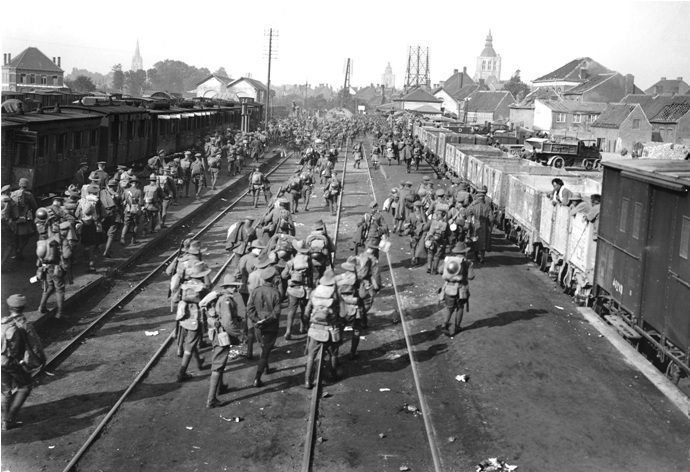 We based ourselves in Poperinge, which was sufficiently far from the devastated and levelled town of Ypres to serve as a major staging post for munitions, supplies and men arriving at its station [see the image above], and for casualties being shipped back to the coast or to Britain (a slower and much more difficult journey). 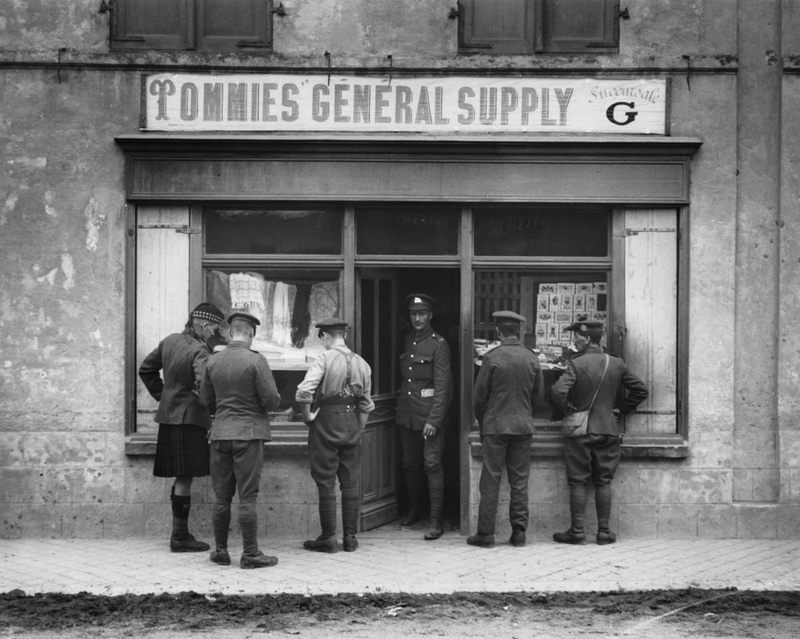 It was also the place (known to the British as “Pop”, supposedly the Paris of the Front, at least around Ypres) where soldiers on leave from the Ypres Salient went to have as good a time as possible, in the shops, bars, restaurants and brothels. Until now scholars have looked for the source of the indomitable Tommy morale on the Western Front in innate British bloody-mindedness and irony, not to mention material concerns such as leave, food, rum, brothels, regimental pride, and male bonding. However, re-examining previously used sources alongside never-before consulted archives, Craig Gibson shifts the focus away from battle and the trenches to times behind the front, where the British intermingled with a vast population of allied civilians, whom Lord Kitchener had instructed the troops to ‘avoid’. Besides providing a comprehensive examination of soldiers’ encounters with local French and Belgian inhabitants which were not only unavoidable but also challenging, symbiotic and uplifting in equal measure, Gibson contends that such relationships were crucial to how the war was fought on the Western Front and, ultimately, to British victory in 1918. What emerges is a novel interpretation of the British and Dominion soldier at war. 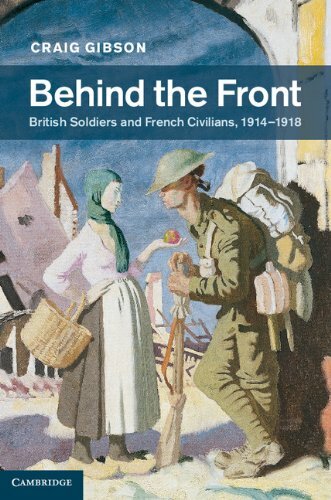 And while I’m on the subject of medical-military machines, Britain’s Arts & Humanities Research Council has a new website, Beyond the Trenches, which is devoted to recent research on the First World War. One of its opening (short) essays is by Jessica Meyer on The long trip home: medical evacuations from the Front, which coincides with the first phase of my new research project. 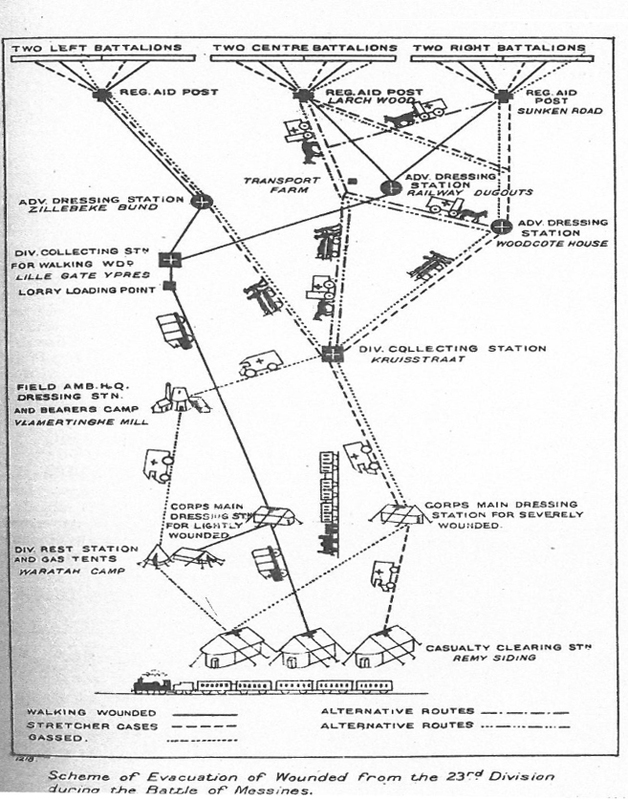 It’s a skeletal account of the casualty chain, or rather chains, and doesn’t flesh out these precarious journeys like Emily Mayhew‘s marvellous social history, Wounded: from battlefield to Blighty, 1914-1918 (see here). But it’s an interesting introduction to some of the logistical issues. 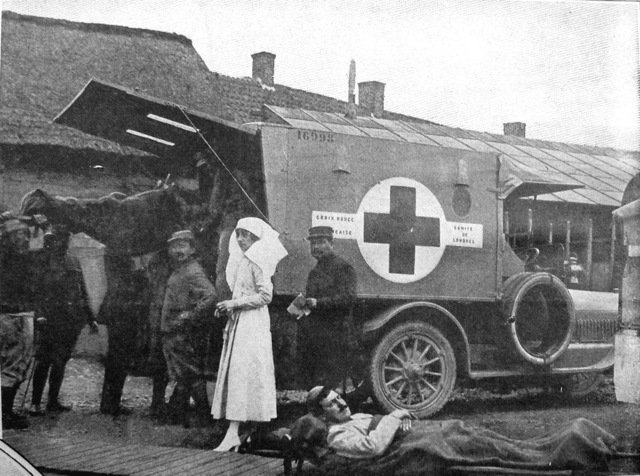 The essay has been prompted by a new BBC drama series, The Crimson Field, set in a British field hospital, which in its turn was apparently inspired by Ellen Newbold La Motte‘s first-hand account of a French field hospital, The backwash of war: The Human Wreckage of the Battlefield as Witnessed by an American Hospital Nurse (1916). This is now sitting on my Kindle (and you can also download it free from Project Gutenberg here): its ‘warts-and-all’ portrayal was so vivid that it was banned by the American government when the United States entered the war in 1917. La Motte worked under Mary Borden, incidentally, who recorded her own experiences in The forbidden zone (more on the two women here, you can read the book here, and there is a helpful essay by Ariela Freedman, ‘Mary Borden’s Forbidden Zone: women’s writing from No Man’s Land’ in Modernism/modernity 9 (1) (2002) 109-124). Having just returned from doing just that, I have to say that I saw remarkably few signs of crass commercialisation or opportunism: I was struck again and again by the dignified way in which the hideous events of those years have been recovered and commemorated. There was refreshingly little jingoism too: just a quiet sense of the enormity of it all. One of the most poignant exhibits I saw was a photograph of families visiting the war graves shortly after the Armistice, trying to find the site where a husband, a brother or a son was buried or, failing that, the place where he had been killed (since the graves of countless thousands were unknown). 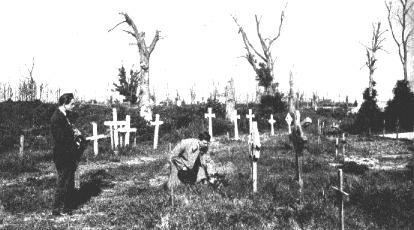 By then, the graves were being systematised and the cemeteries organised (see here), but the surroundings were still hauntingly raw: there had been no time for the ravaged landscape to recover, the blasted stumps to be torn out, and the trenches to be ploughed over. It was sobering to imagine families, already burdened with grief, seeing for themselves a landscape which must have revealed, at least in part, something of the horror of the war that had been for so long hidden from them. This entry was posted in casualties, medical geography, World War I and tagged casualties, Ellen La Motte, First World War, Flanders, Mary Borden, trenches by Derek Gregory. Bookmark the permalink.